By Peter Anderson 18 Comments - The content of this website often contains affiliate links and I may be compensated if you buy through those links (at no cost to you!). Learn more about how we make money. Last edited November 19, 2018 . Christmas is still a ways off, but if you head out to any of your local stores it's pretty likely they're about to start stocking their shelves for the Christmas season. I was at my local Target store this week and now that Halloween is in the past they're putting up the Christmas tree displays, selling wrapping paper and Christmas gifts galore. They were even playing Christmas music over the loudspeakers. Everything they do is done in order to make as much money on you and Christmas as they can. That's understandable – they're in business to make money. At our house Christmas is important because it's a time to celebrate the birth of our savior, a time to enjoy being with our families, and it's a time to sit back and be thankful for all of the blessings that we've been given. 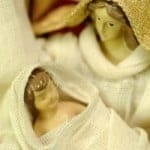 The materialism that has overtaken Christmas in our culture, however, makes it easy to make Christmas be all about the gifts. 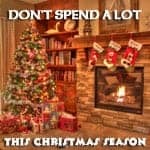 If you're not careful it can quickly become the most expensive month of the year. 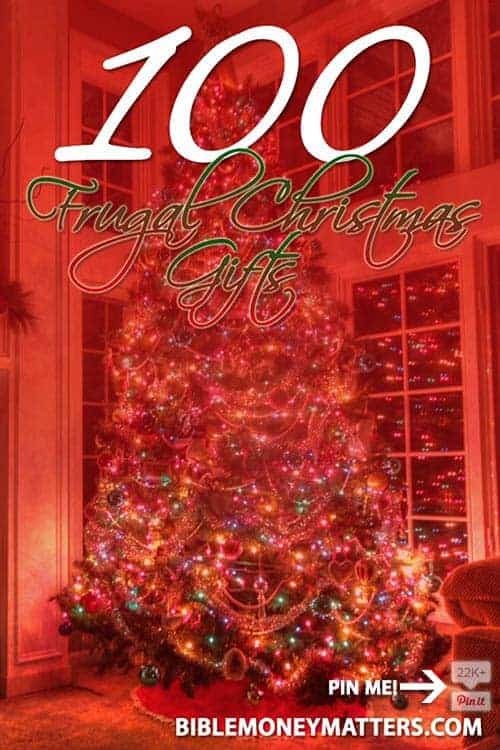 Today in this post I thought I would expand on a list of frugal Christmas gifts that I put out last year – expanding the list to a nice round number of 110 frugal Christmas gifts. Have your own ideas? Please feel free to add them in the comments! NOTE: The frugality of the gifts vary from gift to gift, but I've linked some possibilities on Amazon and other sites. You can probably find some cheaper ways to put these things together yourself if you try. Free Internet Access: FreedomPop offers 500MB of Free Internet access on-the-go. They have compact and sleek hotspots – the perfect stocking stuffer. Best of all you'd be giving free internet every month for the rest of their lives. Most affordable hotspots can be had for $40-50, or less if you find a deal. Full review here. If you've got an old laptop, make a frugal digital picture frame out of it! : At 14-15″ it'll be bigger than most you buy at the stores, and cheaper since you'll be using old parts! Cut the cord kit: Help someone cut the cord on cable TV by buying them a lifetime license to PlayOn online DVR software and a streaming device like the Roku Ultra. : I used a small business on Etsy to have a custom laser-engraved piece of art created (see it to the right). Affordable for a custom piece of art! Personalized Calendars: Most photo processing places will have these personalized calendars you can buy, or pick up pre-made ones in Target's dollar bins. Get photos of you and the person you're giving the gift to in each season, and place them in the appropriate month/season of the year! Themed gift baskets: Give a themed gift basket. For example, a movie night theme basket with microwave popcorn, a movie or two, and some cheapo popcorn buckets from Target dollar bin. Custom t-shirts: Create your own custom t-shirt for a family member on Cafepress. It can be cheaper than you think! Scrapbooks: Make a scrapbook for a close friend showing moments you've shared together. My wife did this for a friend's wedding. Very meaningful. Donation to a local charity: Give to a local charity in someone's name. Make sure it's a charity that they would actually give to. Handmade Christmas ornaments: make personalized Christmas ornaments for your friends and family! Board Games: buy a board game, a gift that gets the family together and keeps on giving all year long! Even better, if you can find some board games at garage sales or on ebay, create a themed game night gift basket (see above)! Family history DVD: Put together a family history DVD with photos, written family histories, family tree, video and anything else you can think of. Framed family picture: Take a picture at a family event, frame it, and give it as a gift! Coupon Books: Make a personalized coupon book with such favorite coupons as “back rub”, “dinner” or “clean the house”. Or for parents, give them babysitting coupons! Make a blanket: make a nice fleece blanket. Instructions here. Make some custom painted wine glasses: Make some custom painted wine glasses, and then give them along with a bottle of wine. Instructions here. Give a magazine subscription: My brother loves reading National Geographic and the Economist. We gave him subscriptions as a gift. Romantic evening gift set: Candles and silk flower petals! Cheap and fun! Keeping warm gift set: Give a gift set of hat, scarf and gloves. Add long underwear as well if you wish! Leatherbound journal: buy a nice leatherbound journal at your local Borders or Barnes and Noble. They make for a nice gift. Add a nice pen if you want to pay a little more. Craft Kit: Put together a crafting kit with things like markers, glitter, scissors, clay, crayons, glue, paper, etc. Photo Collage: If you're handy with Photoshop or another image editing software, create a photo collage/montage, print it out and frame it! Or if you don't have Photoshop, print separate pictures and create a collage. Movie Tickets: Buy a pair of movie passes or a movie gift card for someone to go see a movie. Not as cheap as it used to be :). Flannel Sheets and PJs: Buy a keeping comfy gift pack with flannel sheets and pajamas! Coffee lovers gift pack: Buy some gourmet coffee and a personalized coffee cup for the coffee lover on your list. Set of soaps, towels and soap dish: Put together a nice matching set of hand towel and soap dish, and then give some handmade soaps. Homemade glycerin soaps with toys inside: Make your own soap for kids that has toys inside. The child has to lather up to get the toy! Big breakfast gift pack: Put together a gift pack with pancake mix, batter dispenser, syrup and pancake mix-ins. Puzzle day: Give a gift pack of a puzzle and snacks to eat while you do the puzzle! BBQ Kit: Get some BBQ sauce from local source, and add it to a nice BBQ Utensil kit. Basket of spices and seasonings: Put together a basket of seasonings and spices from a local spice or grocery store. Make sure to get a good mix for cooking, BBQs, etc. Netflix or Amazon Prime subscription: Pay for someone to have Netflix or Amazon Prime for a couple of months. If they have a connected device, they can even stream movies! Deck of cards and book of card games: Buy a cheap pack of cards, and a book listing the rules of different card games. Good for hours of fun! Cheap keychain digital picture viewer: Buy someone a cheap digital picture viewer keychain (around $15?) and fill it with pictures. Bath time gift pack: Buy a nice wash clothe, some bath oils/beads and even some lotions at your local bath store. Laser Etched Crystal: Need a unique Christmas gift? Turn any photo into a 3D crystal image. While this isn't the most frugal option on the list, if you're looking for something special, you can find something well under $100. Use coupon code BUY3DGIFTS to save 20%. Botanicals: buy a nice low maintenance plant to brighten up their day, along with a small watering can. Make a recipe box: If you're good with wood, make a nice recipe box, and fill it with blank recipe cards. An appreciation book: Get a nice journal, and write in it to the person about how much you appreciate them, things you love about them, shared moments and experiences and general encouragement. Even add a few photos. Chocolate attack! : Put together a gift pack with all kinds of chocolate. Hot chocolate, chocolate bars, truffles, etc. Car wash kit: Put together a kit for washing the car. Can include things like sponge, tire brush, bug remover, car soap, etc. “That's a spicy meatball” gift pack: Give them a nice Italian dinner with a pasta bowl, pasta, strainer, fancy olive oil, pasta utensils and even some sauce. Give your service: Good at cooking? Offer to come over and cook a gourment meal. Are you a designer? Offer your design services for free. Good with computers? Offer free tech support. You get the idea. Wine and cheese gift pack: Buy a variety of specialty cheeses, crackers and a bottle of wine. Put it together and you have one gourmet evening! Picnic pack: Put together a picnic pack with a blanket, a basket, some cheap utensils and plates. Sewing Kit & lessons: put together all the sewing essentials (thread, needles, pins, etc) and then give the person lessons on how to sew. Gardening gift pack: Buy the person gardening gloves, gardening tools and some seeds. Put them all in a small bucket or watering can. Handmade jewelry: Make a handmade necklace or bracelet at a local bead or craft store. Give it as a meaningful gift. Beer afficionado gift pack: Give a beer mug, snacks and gift card from a local brew pub. A Birdhouse: Give your loved one of these bluebird houses so they can relax on the porch and watch the colorful avians. Used electronics: Have an extra MP3 player and know someone who needs one? Clean up your spare and give it as a gift! Art lovers gift pack: Get a free photo canvas of one of your favorite photos, along with supplies to hang it. If the person is artistic, put together a gift pack with art supplies! Give a memory photo book: Give the person a photo book that includes memories of you and that person together. Accessories: Know someone with the new iPhone? Give them an Iphone accessories pack. Father with a Android phone? Give him his own cell phone accessories. Host a party: Instead of giving gifts to a large group of friends, invite them over for a Christmas party that you host. Give the gift of a blog: Know someone who might enjoy blogging? Buy them a domain name, setup their blog and host them on your hosting account if you have one! Buy a copy of my ebook for them! Give the gift of communication: Know an older member of the family who doesn't have a cell phone? Buy them a cheap pre-paid phone and a small amount of air time. As cheap as $20-30! Take someone out to dinner: Take a friend or family member out to dinner at a reasonably priced restaurant on the house! Tea gift pack: Give a nice teacup along with a selection of teas. Make a memories CD for a parent: If you're younger make a memories CD for your mom and dad with photos, audio or video of you talking about good times you've shared, and maybe some written memories. Yard Work Coupons: Have an elderly family member or friend? Make up some nice looking coupons for free yard work or other odd jobs on your computer. Scrappers gift pack: If you know someone who enjoys scrapbooking, put together a nice canvas bag with scrapbooking materials, and maybe a gift card to Michael's or other craft store. Sports gift pack: Know a kid who enjoys sports? Put together a sports gift pack with equipment for several different sports. Recipe gift pack: Give the gift of several of your favorite recipes, and a gift card to a local grocery store. Create a memory jar: Have a bunch of friends write down favorite memories of the person receiving the gift – get as many as you can. Then put them all on small pieces of paper, and put them in a decorated jar with the instructions to open one fun memory every day. Put on a concert: If you're musically talented, put on a Christmas concert for family and friends. If you want to give to others, go to a local nursing home and play! Football gift pack: Have someone obsessed with football? Get them a t-shirt for their favorite team, a team blanket for cuddling up and watching games on Sunday and some snacks! Write a poem: Write a “Where I'm From Poem”, either about yourself for the gift receiver, or about them. Details here. Custom collage notebook: One year my brother made me a notebook that had a fun photo and magazine clipping collage on the cover. It was creative and I used that notebook for quite a while. Movie based on a book: Buy someone a book that you enjoyed, as well as the movie based on that book. A secret hiding spot book: You can make someone a book with a secret hiding spot where they can hide money or their secret identity. Or a slightly less frugal alternative. Give a retirement planning book: Have someone who is always asking for financial planning advice? Give a book like “Can I Retire?” from fellow financial blogger Mike Piper. Children's imagination kit: Give a child a kit full of things to help them be creative and imaginative. Things like a sketch book and colored pencils, scissors and paper. Then make a list of creative ideas of things to do – like use your kit to make tickets to a play, and a playbill – then give a play! A Yo-Yo: You can buy a yo-yo for less than $5 on Amazon, but kids will have hours of fun trying to master their new toy. For younger kids, get one of the auto-return yo-yo models for less frustration. Brand new thrift store finds: Visit your local thrift store. They often have brand new toys, craft kits and more that were donated by local stores. Buy something new, at a used price. Write and illustrate your own children's story: Instead of buying a children's book, write and illustrate your own – and personalize it for the child. Make a broken crayon t-shirt with your kids: Use those broken crayons that kids have lying around to make a creative t-shirt for another kid! Or instead of a t-shirt melt down your crayons and make new crazy color crayons in your own custom mold. Car emergency kit: Put together an auto emergency bag for someone's car that includes a nice flashlight, batteries, candle, matches, jumper cables, and anything else you can think of. Teacup candle: Take that family heirloom teacup and put it to good use by making a teacup candle out of it. Include a story of where the cup came from and why it's special. Christmas party games book: Put together a book of Christmas party games that the giftee can play at their party. Read a children's book .MP3/CD: If you're a grandparent or have kids, get a cheap usb microphone and read a selection of the kid's favorite books and record them to a CD or set of .MP3s that the children can listen to. Or buy a few new books and read those. Brew your own beer and give some away: I know of one gentleman who brews his own beer, and then gives away growlers of his home brew for Christmas. Homemade refrigerator magnets: Make creative magnets for someone's fridge. Things like marble magnets, photo magnets or to-do list magnets. Kids dress-up box: Put together a kids play kit with old jewelry, clothes, wigs or other accessories so that the child can play dress-up. Good night sleep tight gift set: Put together a gift package with a cute nightlight and set of books for story time. Make a marshmallow gun: Boys on your list will love this gift – a DIY marshmallow gun. Homemade treasure soaps: Make your own treasure soap for kids on the list with cool treasures (like small rubber toys) encased. Make your own Jerky: I've actually gotten homemade jerky from a friend for Christmas. It was delicious. Enough said. A basket of your favorite things: Go to a store and fill a cheap basket with some of that person's favorite things. Favorite candy, favorite food, favorite movie or book, etc. Change jar savings kit: Give a child a change jar of some sort, with some starter change already in it. Then teach them about money! Draw names, give one nice gift: Our family has done this some years where instead of buying 10 so-so gifts – often for $10-30 each, we'll buy one nice gift for $50-100 for one family member. Nice way to save money and have each person get one really nice gift. Keep in touch kit: Have an older relative you'd like to keep in touch with more? Buy them a cheap webcam and install it and Skype for them. Install a free remote desktop software like Logmein.com in order to help them connect if they can't figure it out. Wooden toys or gifts: You can go to a woodworking store and buy DIY wooden toy kits, or plans to make your own pretty affordably. My dad bought me wood one year, then we did the DIY woodworking project together after Christmas. Bluetooth headphones: You can buy a pair of bluetooth headphones for $10-20. With kids playing on their phones and tablets so much these days, the gift will be appreciated by them and their parents for the silence it brings. Garage sale refurbished items: Find something cool or vintage at a garage sale, refurbish or turn it into something new and give it as a gift! Camping gift pack and experience: Have a kid that loves camping? Put together a small camping gift pack (flashlight, knife, backpack) and then a certificate promising to take them camping when it's nice out. Write a nice letter a month: Write the person a nice personal letter about the things you appreciate about them, then send them another one each month of the year. In the age of Facebook it can be nice to receive something besides junk mail when you open the mailbox. Custom herb-infused olive oil: Make and give the gift of a custom olive oil infused with the herbs and spices of your choice. DIY key rack: Make a unique DIY key rack for someone – after all – don't we all lose our keys at one time or another? Give a golden ticket: Give a child a “golden ticket” just like Willy Wonka. The ticket can be used for a special day of fun at the zoo, local aquarium or other attraction or activity of the child's choice (within reason). A Groupon experience: Buy the giftee a certificate for some sort of experience from Groupon. Examples: Massage, salon experience, painting lesson. Save up to 90% or more on your gifts: Save a ton of money on your gifts by using a service like Snagshout. Snagshout allows you to purchase items on Amazon at a reduced price in exchange for an honest review. Try out the gift, review it and then give it as a gift while saving money! (Full review of Snagshout) I bought a $75 flashlight for $9.99 on Snagshout – and love it! Discounted gift cards! : Buy your gift cards at a discount at a site like GiftCardGranny. For example, when I last checked AMC movie gift cards were sold at a 21% discount! So there are my 100 ideas for frugal, creative or homemade Christmas gifts. What ideas do you have or have you used in the past? Tell us in the comments! Most of these are gift ideas, but not exactly inexpensive…a look at them puts many of them in the $80-$150 range, which is well out of range for many of us frugal folks. In other words, the gift ideas aren’t all frugal if you buy them outright. They’re meant to be a starting point to get you thinking about creative ways to give at Christmas. If you were to put the gifts together on your own – without buying the pre-made version – they will be a lot more frugal. Thanks Kate! 80-150? Not necessarily. Obviously if you buy the items pre-made online they will probably come at a higher cost.That being said, I have on more than one holiday utilized some similar or same ideas and not spent that amount. Last year for example. I made painted coffee cups (Similar idea to #17). It cost me 2$ for brushes, 3$ for paint, and 16$ est for the glasses. I filled them with bagged hot chocolate and crushed candy canes, both of which i got under 3$. So for 26 bucks estimate, my extended family was good, they loved it too because the gift was less superficial.. Hard to find cool stuff these days. I also crocheted scarfs which cost me about an additional 20$. If truly intending to be frugal, its all about how creative you choose to be within your means (Pinterest is awesome for that!). Another example would be #7 or #19. Both of these sets could be easily done for under 10 bucks. Best of luck to you! Great ideas! I’d love a book if one is still available! Sorry giveaway ended a while ago. I want to do the retirement book for my brother, hopefully in the first or second commenting! I always feel like artists and crafters have it the best during the Holidays. They get to be extra frugal by making their own gifts! This is a great list by the way. I like that it includes gift packs. If you know something they are interested in, say golf, you can buy some tees, maybe a sleeve of golf balls, a few other small golf accessories and you will have a nice gift. I like to work with plastic canvas, so I’ll make bookmarks with 10-count canvas (so they’re not too thick) with the person’s name, or whatever they want it to say, stitched into it, and/or small 9-patch quilt magnets (in 7-count canvas) colour-coordinated to the person’s kitchen. I’ve got patterns for both the 9-patch and the alphabet, so I stitch the bookmarks with the lettering pattern, and the 9-patch is a very simple long-stitch design that takes me about an hour & a half to finish, because I’ve made so many. I love the100 Frugal Gift ideas in this post..I just discovered loom knitting character hats and scarf to match an easy project for children to learn which keeps them warm during the winter.Michaels Stores in my area accept knitted items they donate to people after box is full. How can I get in touch with WoodRockz? Thank You so much for the Awesome ideas. I would love to get the book ” Can I Retire ” by Mike Piper ? Sorry, but the books have already been given away! 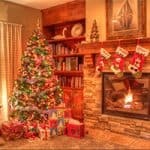 I recommend you a website called Cashbackbase which can help you save on preparing gifts!